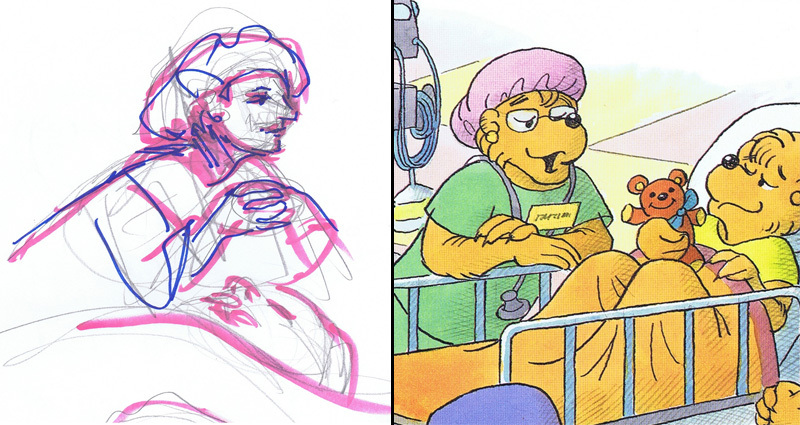 On April 21st, HarperCollins Children’s Books will release a special new Berenstain Bears book: The Berenstain Bears Hospital Friends. 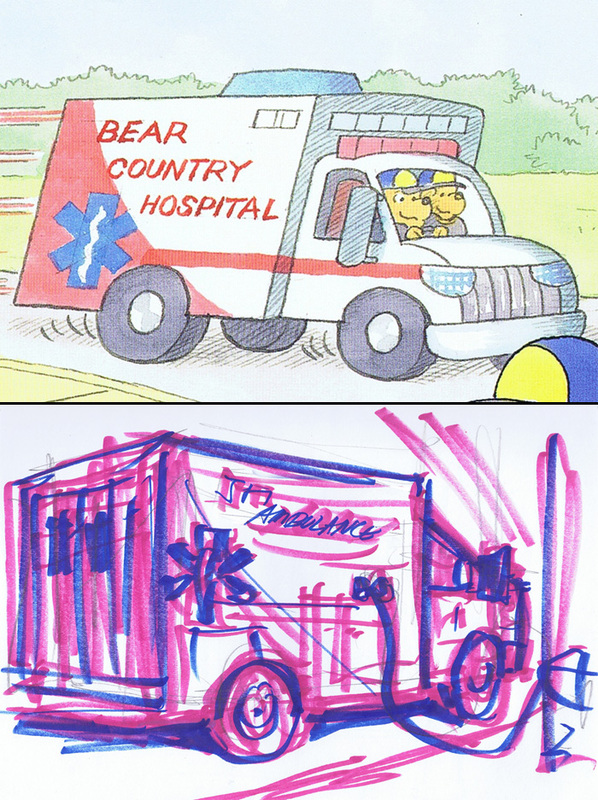 Hospital Friends represents the fulfillment of the Berenstains’ long-cherished dream of adding a story about visiting the hospital to the Berenstain Bears series. All author’s royalties from the sale of this book will be donated to the Stan and Jan Berenstain Healthy Kids Foundation, which is devoted to the funding of children’s health and well-being initiatives! 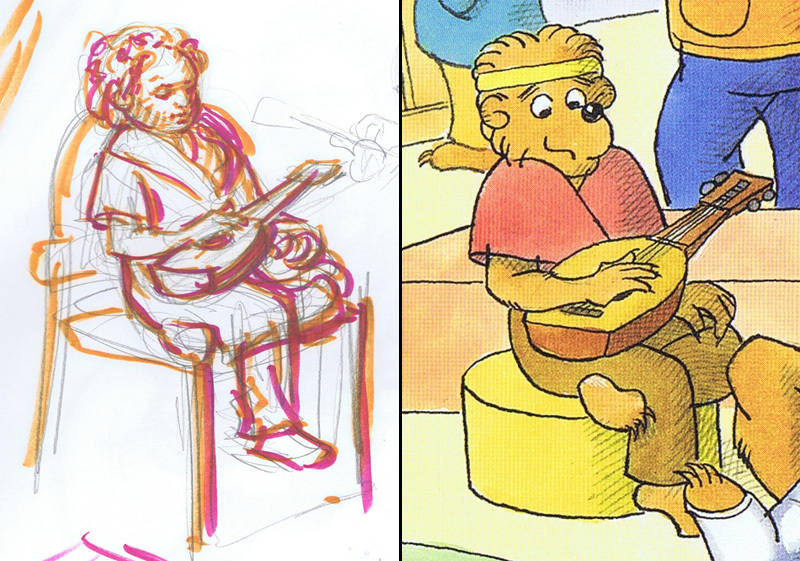 In order to make Hospital Friends as accurate and informative as possible, Mike Berenstain based the book’s illustrations on sketches he made while visiting a local children’s hospital. Read his account of the process below, accompanied by a few sneak peaks of the finished book alongside the sketches that inspired it! 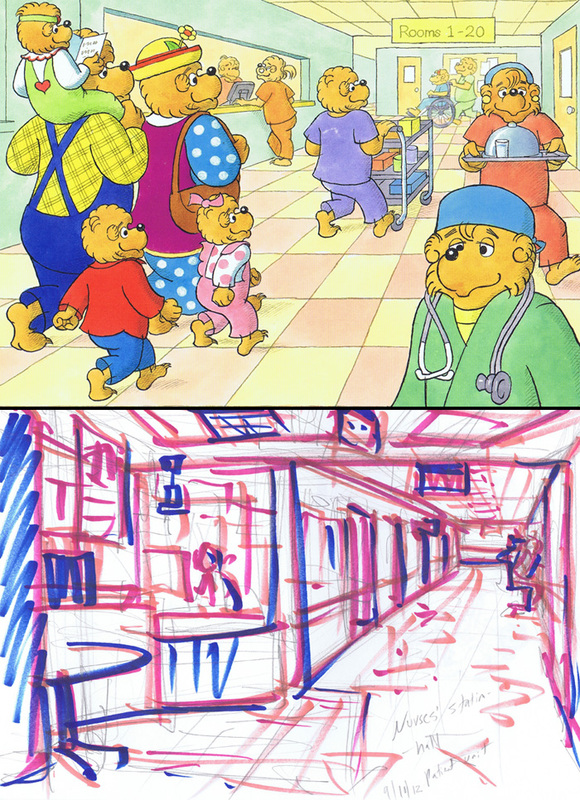 Being given the run of a children’s hospital to do visual research by on site sketching was crucial to making The Berenstain Bears’ Hospital Friends as medically accurate and authentic as possible. It was also very satisfying for me as an artist to be able to directly experience and record the behind-the-scenes workings of this great institution. An additional personal reward for me was the opportunity to witness my wife, Laura, in action in her professional role as anesthesiologist–something I would not, otherwise, be allowed to do–there is no normal provision for “Spouse’s Visiting Day” in the OR. Over many days, I visited and sketched several ORs, pre-op and recovery rooms, Radiology, Physical Therapy, the Emergency Department, waiting rooms, a patient unit, and an outpatient surgery center. 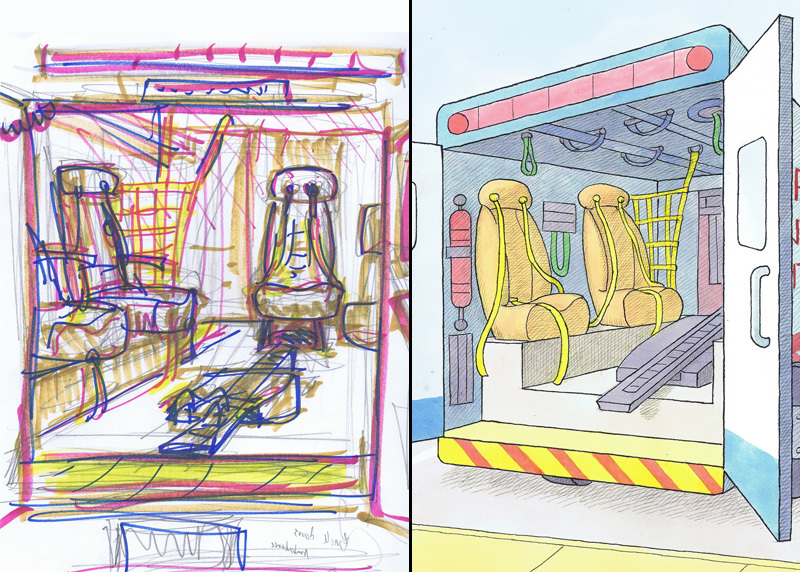 In addition to using this experience for the general background of the book, I tried, wherever I could, to use the literal scenes, poses and situations of the patients and medical staff I sketched as the basis for the characters and scenes in the book. The only difference is that instead of people–they’re bears! Everyone at the hospital was immensely gracious and cooperative in making this possible. They all seemed genuinely pleased to have me there, constantly getting in their way, as they went about the immensely demanding and exacting work of providing care for those children who need it the most. 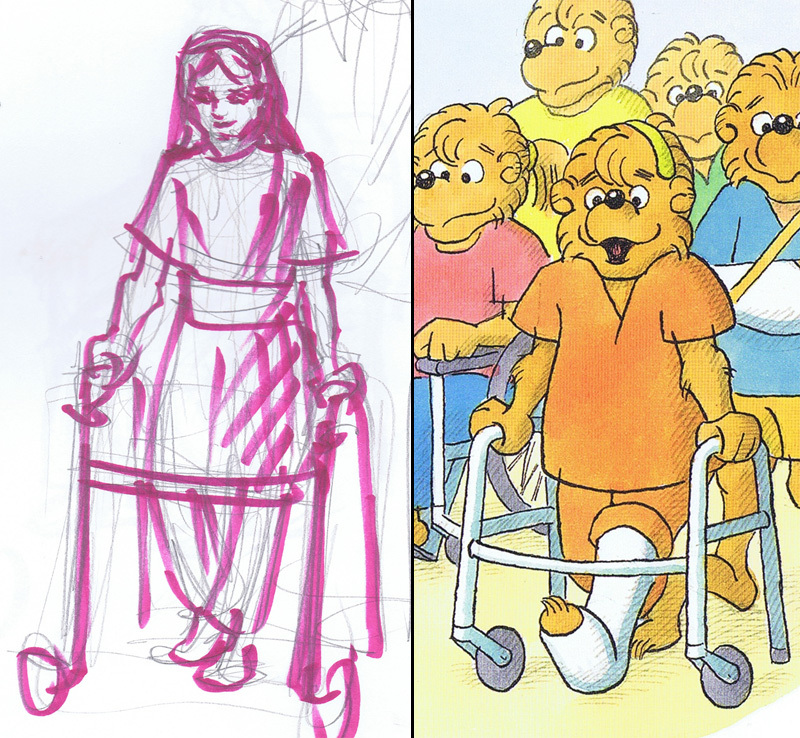 Pre-order The Berenstain Bears Hospital Friends today! 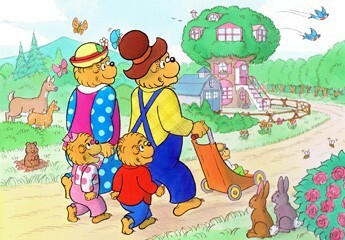 We are pleased to announce the creation of the Stan and Jan Berenstain Healthy Kids Foundation. Formed by the Berenstain family to honor Stan and Jan’s memory, the Foundation is devoted to the funding of children’s health and well-being initiatives. Inspired by the childhood-celebrating and family-affirming message of Stan and Jan’s creative legacy, we are seeking out those who share our goal of providing for that most basic of all children’s needs: good health. 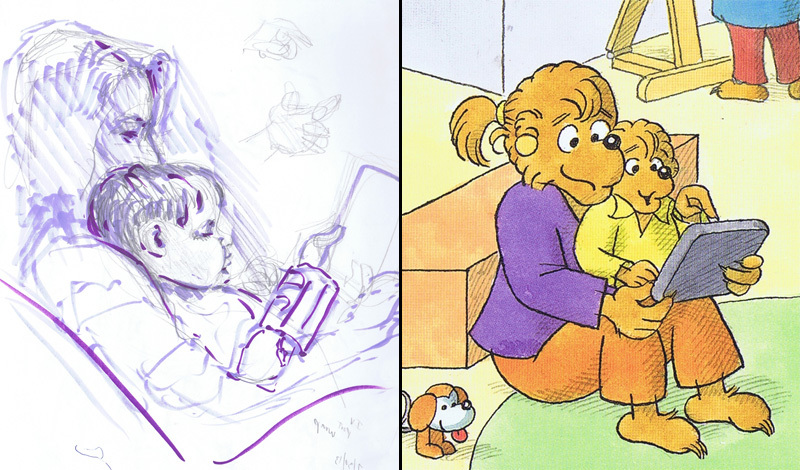 Initially funded by a contribution from the Berenstain Family, the Foundation will receive ongoing financial support from the publication of The Berenstain Bears’ Hospital Friends by Mike Berenstain, forthcoming from HarperCollins in April 2015. All author’s royalties from sales of this book will be donated directly to the Foundation. 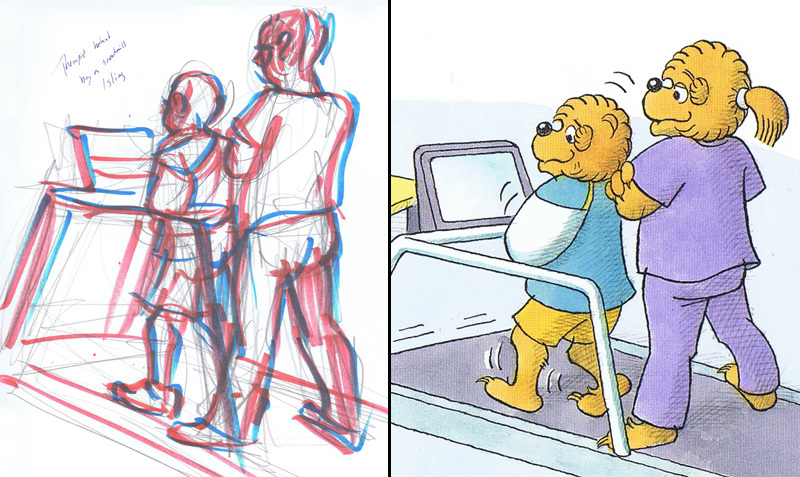 This new book is a fulfillment of the long-cherished dream of adding a story about visiting the hospital to the Berenstain Bears series, which has for decades a source for children coping with new experiences and problems. When Mike Berenstain married Dr. Laura Diaz—pediatric anesthesiologist at The Children’s Hospital of Philadelphia (CHOP)—they immediately began making this dream a reality. 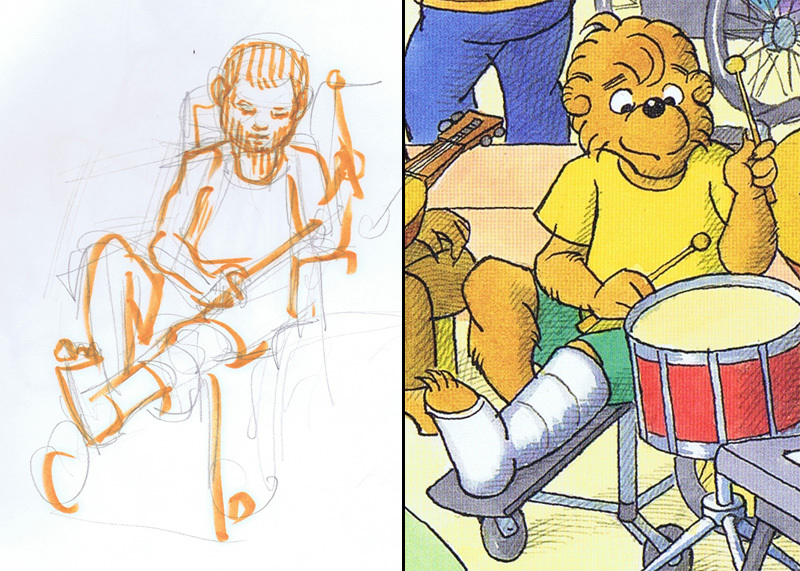 With Laura’s help and CHOP’s sponsorship, Mike toured the hospital, interviewed staff and used sketches made in every medical department to create the book’s illustration. The first project given funding by the Stan and Jan Berenstain Healthy Kids Foundation joins a medical mission with the spirit of art. Face to Face: The Craniofacial Program Portrait Project is a collaboration between CHOP, the Studio Incamminati School for Contemporary Realist Art, and the Edwin & Fannie Grey Hall Center for Human Appearance. Artists are commissioned to create portraits of young patients with craniofacial conditions to help them gain self-esteem and social resilience. Of added interest is the historic connection between this art/medical project and Stan Berenstain’s service as an Army medical illustrator during World War II. His art recording operations on war wounds was donated to the Army Museum in 2010. The collaboration between the creative and medical worlds has been furthered by the make-up of the Foundation’s board, consisting of members of the Berenstain family along with outside medical directors associated with The Children’s Hospital of Philadelphia. Long term, the Foundation intends to meet the requirements to qualify as public foundation, maximizing its potential for growth and increased funding. We hope that you will join us in supporting this exciting new undertaking growing out of the life stories and life’s work of Stan and Jan Berenstain. For more information, to contribute to the Foundation, or to explore other ways to partner with the Foundation in its work, please visit our website or contact us at: general@berenstainfoundation.org.